Isabelle Meuret: Writing Size Zero. Figuring Anorexia in Contemporary World Literatures (Comparatism and Society, 3). Frankfurt am Main: Peter Lang, 2007. Pp. 294. Paper  35.20. 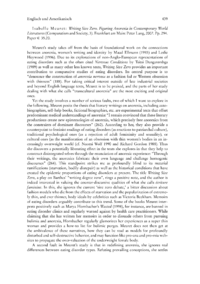 Meurets study takes off from the basis of foundational work on the connections between anorexia, womens writing and identity by Maud Ellmann (1993) and Leslie Heywood (1996). Due to its explorations of non-Anglo-European representations of eating disorders such as the often cited Nervous Conditions by Tsitsi Dangarembga (1989) as well as many other less known texts, Writing Size Zero provides an important contribution to comparative studies of eating disorders. Its central purpose is to denounce the construction of anorexia nervosa as a fashion fad or Western obsession with thinness (188). For taking critical interest outside of late industrial societies and beyond English language texts, Meuret is to be praised, and the parts of her study dealing with what she calls transcultural anorexia are the most exciting and original ones.